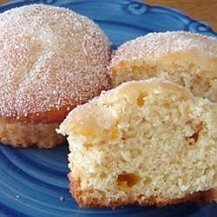 This peach muffin recipe produces muffins that are so fluffy, light and taste like heaven. Here's a tip to make fruit muffins using this recipe. Instead of peach yogurt use vanilla yogurt (or strawberry yogurt for strawberry muffins), and add fresh raspberries (or banana, blueberry, etc). Experiment with it to create your very own personalized muffins. PREHEAT oven to 400 degrees and grease muffin cups. In a large bowl, combine flour, pecans (if you are using them), sugar and baking powder. Combine egg, yogurt, milk, butter and vanilla; mix well. If the batter is still too thick, add more milk; a little at a time. Stir into dry ingredients just until moistened. Fold in peaches. Fill muffin cups two-thirds full. Bake for 15-20 minutes or until muffins test done. Cool in pan 10 minutes before removing to a wire rack.